The stockings are hung, the garlands are strung, glimmering tinsel is dangling from each branch of the tree in the living room—it’s almost too much for any cat to resist. It stands to reason that they deserve some kind of reward for resisting temptation (or at least trying to) all through the holiday season. 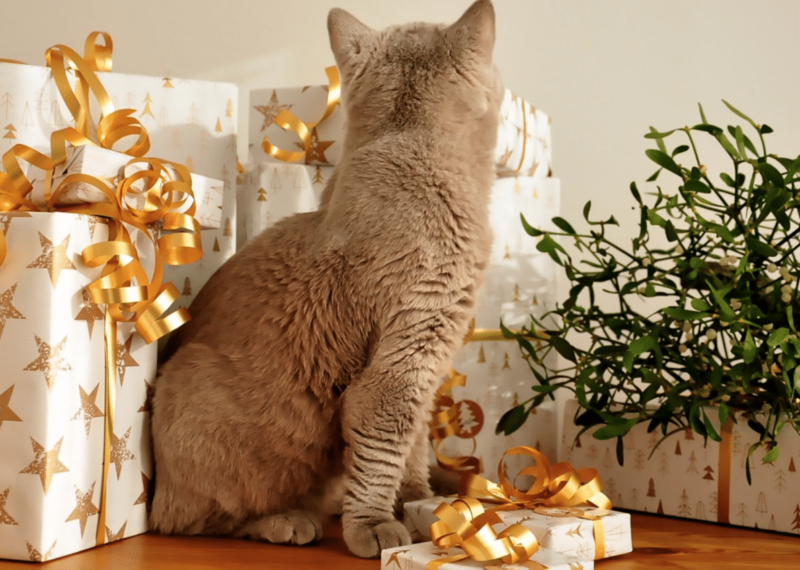 After all, everyone loves getting presents on Christmas morning…even our pets! If you want to make it a very “meowy” Christmas for your favorite feline, we at The Cat Clinic at Cherry Hill have a few great gift suggestions that they’re sure to enjoy. A new scratching post: If the current scratching post has become a bit of an eyesore after too much wear and tear, it may be time to upgrade it (before the couch starts getting some unwanted attention from your little Santa Claws). A heated bed: Anyone who has ever had a furry friend curl up on their laptop can attest that cats are drawn to warmth wherever they can find it. As temperatures drop and sunny spots in the house get fewer and fewer, your cat will appreciate a warm place where they can curl up and nap. Catnip toys – You can buy these at basically any pet store, or you can make them yourself. Check out how to tackle this simple and fun project here! This article gives you six ideas for the craft. And for those looking to save some money: Stay thrifty with balled up wrapping paper from the rest of the family’s gifts! One of the best things about owning a cat is that they are very easily entertained and can make a toy out of nearly any object, whether it’s a piece of string or a moving spot of light. If it’s time to bring your kitty in for a checkup, don’t hesitate to contact us and schedule an appointment! Give the office a call at (856) 662-2662 or visit us at 35 Haddonfield Road, Cherry Hill, New Jersey.